I have been in pain and walk with a limp from an overuse injury for over 10 years and had numerous types of treatments to fix but nothing ever really worked or only provided temporary relief. I have only had 3 treatments with Steve and this is the only time I have had significant improvement. I am in awe of his skills. After each treatment I am more mobile and able to use my muscles for longer periods without them getting fatigued. I went from walking with a limp to walking without pain. I am able to do more exercise and am now able to build some core strength without relapsing or causing more injury. He is a true miracle worker. Thanks Steve. Knows exactly how to tend to the muscles in my body! Despite having had many injuries over the past 34 years, and physio treatments that often caused more pain than healing, Steve was able to rectify some long term muscle issues very quickly, with lasting positive effects. I highly recommend his skills to anyone!! especially those with persistent pain from injury or overuse. Steve is an exceptional massage professional. He has a rare therapeutic gift. Prior to his moving to Robina I had regular massages from him in Sydney over many years after which I always felt refreshed and re-programmed. On a recent visit to the Gold Coast, I treated myself to a session with him, nothing has changed and I still could not recommend him highly enough. Steve’s treatments have been fantastic. The best and most thorough treatment for my neck and back pain. I’ve had treatment with chiro, physio, acupuncture with no results and a lot of expense. After my first treatment with Steve almost 4 years ago the constant pain and tightness was relieved – the difference is Steve’s treatments target the root of the pain not just the symptoms. So the problem is really being fixed! I only see him every 6-12 months for a treatment it was the best recommendation I’ve ever had! Steve Lockhart is an exceptional massage therapist who has treated my shoulder, back and neck pain as a result of tears to rotator cuff tendons over some time with great results that have increased mobility and reduced muscle tightness significantly. As a health professional, I suffered with a debilitating lower back injury. Everybody in medical and allied health had their opinion about which form of surgery would be best, or how my recovery would be non-existent. That is when I found Steve Lockhart! What a lifesaver! After just three months post all of those recommendations I am walking, moving and functioning so much better than anyone could have imagined. The magic of the composite treatment offered by Steve Lockhart is all encompassing. It has been nothing less than miraculous. I would encourage anyone to contact Steve Lockhart and try the program. It is life changing. Thank you Steve for giving me back my life. My problem started 3 years ago with back pain and progressed into my left leg. After ex-rays and scans nothing showed up. Steve discovered congested muscles which he managed to loosen up for me. One of my leg was shorter and the longer leg very painful after seating for 15 minutes in car or chair. Could not put weight on that leg for about a minute. So sciatica was the problem and a shame that the medical profession can not diagnose. So happy that I found Steve on the internet. One day after my treatment with Steve I experience no pain and I put this down to my vegetarian lifestyle through the SDA church. Steve was recommended to me by a friend following pain in my leg that was not resolved having seen a Physio and also having dry needling. After just two visits with Steve I have now been able to return to high impact exercise which has been fantastic. Several weeks back I had so severe sciatica and left hip joint stiffness and pain that I hit the Internet in a desperate attempt to find some relief and clues for wellness. I quickly found Steve Lockhart’s site with links to many videos of Steve explaining so many things exactly about my condition. That very day I bought Steve’s book and DVD online. Meanwhile, just from his tips on his website, over the coming days I got significant relief in the sciatic pain. Once the book and DVD arrived my wife, who also had some muscular skeletal issues, and I did the SLM Yoga from the DVD. We also bought, through Steve’s website, a Bioflex Inversion Machine and we are finding it a great tool in our recovery. We also booked to see Steve, who was some three hours drive away. We’ve now had two treatments with Steve. Throughout our treatments we’ve found Steve to be extremely knowledgeable, professional and so willing to help- he is a true gentleman! His lifetime experiences with athletes and the public shows in his hands on massage. I feel that I am on a road to much better health and I have much greater optimism for the future. Thank you Steve! I would recommend you to anyone. I first became aware of SLM Bodywork when in desperation I took to the internet to find help with my sciatica after 15 years of trying all types of assistance to relieve problem. I started with his Self Help Program as I live in WA, he was happy to give me advice in a phone consultation and I then had the opportunity to attend one of his conferences in Thailand. I do visit an SLM practitioner in WA every few months, but often take the time if I am in Queensland to visit and get a couple of treatments from Steve himself – always great results. Recommend him to anyone suffering pain. Steve has a wealth of knowledge and takes the time to properly understand what the issues are. He believes in his program and listens and responds to his patients. I had been in pain for months but after an hour he had me moving again. I have tried lots of other ways including chiropractic and acupuncture but this treatment has given me the best long term relief. I recommend him, but you will need to take responsibility for your own exercise and movement program to get the best result. I saw Steve post-spinal surgery for my sciatica Steve was an excellent practitioner He listens and understands the problem in your own words He has great knowledge and great examination skills that allow him to pinpoint the problems in your muscular system He has a simple approach to providing reactive treatment to the cause of the problem, by using massage and making other recommendations (diet and lifestyle) He has a simple approach to preventing future issues and staying pain free He appropriately monitors your response to treatment and responds accordingly I recommend him for all ages with various spinal and musculoskeletal issues. I have been seeing Steve now for a number of years for a recurring lower back issue which is due to a lack of bone on one of my vertebra. Before I started seeing Steve with my back issues, I was in great pain constantly, to the point I could hardily walk. I had seen lots of other so called professionals to no avail. Steve has been the only person who can ease my pain to the point where I can live a normal life. I have no hesitation in recommending Steve to anybody with a back pain, ‘he’s like a magician he makes the pain disappear”. Steven Bailey. I traveled down from the Central Queensland Coast to see Steve and was not disappointed. I have a herniated disc with sciatic pain and Steve advised me on what needed to be done for improvement. I am confident his treatment has already assisted in helping me be pain free. Whilst in Queensland, I went to see Steve to get some relief from my Sciatica. I was experiencing constant pain and was struggling to function normally. Steve was able to quickly assess my chronic back pain and pin point to where the pain was coming from. His massage technique and pressure methods brought me some relief, so that I could sit down and sleep for the first time in weeks. He provided expertise in exercises that reduced my pain and assisted in my recovery. I found him to be an excellent Remedial Massage Therapist and would recommend him to anybody. I have been to see Steve for sports related massage and manipulation a number of times now. Not only does he know his craft but he is a down to earth and professional individual. I have personally recommended his services to a number of my friends and colleagues and will continue to do so. I will also continue to see him for any future issues regarding his skills. 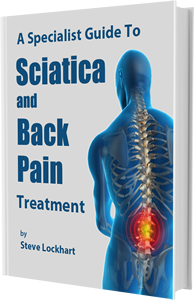 I had been to Steve about 6 years ago in Sydney and returned to see him only recently as he now practices reasonably close to where we now live.I found his treatment to be the best I have ever had and that is from someone who has chronic back problems. First class treatment. I went yesterday for the first time on the recommendation of 3 people I know who have been helped..,I definitely feel better today although I think I will need another go Which I am happy to do as I know he has helped..my thigh is not white hot and on fire like it had been for the last week or so!! But hey.. It hasn’t even been 24 hours yet and he says give it a few days.. I believe him and trust him.. And that’s huge coming from me as I feel so discouraged by the ‘norm’ which I am loathe to use and so I don’t…I felt at ease although it was painful .. Steve is professional .. No frills .. And just does what he does.. GO!!!! If you have pain…. Very experienced and knowledgeable. Relevant and effective treatment from the start. Stephen has a multitude of sports therapy knowledge that manifests itself in his techniques on the table. Although my session was painful it has benefited my training and I recommend his services. Very Knowledgeable, Walked out without pain ,but advised to wait a day or two for proper assessment, treatment was very thorough. Thanks again Steve for a very thorough massage which again is different to previous visits and at this early time following my appointment today has given me some relief from my leg and back pain. I recommend your treatment to anyone suffering back pain. Great stuff. Got my son playing at his peak. Offered good advice on maintaining his optimal spinal fitness. Incredibly knowledgeable and experienced. I haven’t experienced anything like what Steve does before, fantastic results. Extensive knowledge with the best application of treatment ever received. He is very thorough and he fixes my aches and pain. I have had literally thousands of massage treatments over the years. Steve Lockhart is right at the top of the list. I genuinely believe that his knowledge of the human body is unsurpassed and his easy going manner adds to the first class experience. If you are in pain, Go and see Steve. Next option was to go under the knife. Because I suffered back problems for years, and was unable to walk very far. After a few treatments with Steve I don’t have back problems now. I am very discipline and do his SLM exercise daily. I found Steve to have a very pleasant manner, and listened and made sure that you left feeling better. I am 75 years of age, so it’s never too old to strengthen your muscles and have improved balance. I’m like a bottle of red wine, improving with age.! The absolute best massage therapist I have ever been to! Highly recommended! Excellent masseur. Knows his stuff. Steve is a great masseur with lots of experience. Well worth the visit. Stephen Lockhart explains then works his massage explains a long term remedy and fixes your back problems. He fixed my back when everyone else said I needed surgery. Couldn’t be more happy with any therapist ever!! He fixed my back when every other therapist thought I would be needing surgery. Absolute life saver!! I have a major back problem, having tried many different types of pain relief without success I’ve found Stephen Lockhart is the only person who truly gives pain relief without pain killing drugs. He is highly recommended. Very gentle knowledgeable and yet firm! Treatment was fantastic – thank you! Steve’s understanding of the underlying causes of my back and leg pain set me on the path to recovery and long term health. He is an amazing remedial massage therapist who helped me with my lower back pain. Awesome massage therapist! Highly recommended. Before relocating to the North Coast I regularly visited a therapist trained by Steve, he was sensational and I received great relief, so of course when I moved it went without saying that I would visit Steve for relief. I am a swimmer and participate in triathlons for fun and often experience lower back, shoulder and tennis elbow complaints. Stephen Lockhart always gives me great relief and I would recommend him to anyone. I’ve been going to therapists for 25 years prior to going to Stephen & the very first time I saw him, he sorted me out. He continues to work his magic every time! Very experienced and professional. I have been to several other therapist without much improvement but after only one visit to Steve my condition had improved by 90%. I wouldn’t go to anyone else. Steve is the only one that has given me immediate relief from my lower back pain. He provides a no-nonsense approach to health care. He knows his trade and has perfected it. Steve came highly recommended and I had immediate positive results today after my first treatment on a ‘frozen’ shoulder, and more freedom and ease of movement generally (whole body). Steve explained the treatment as it was delivered and provided exercises for me to complete at home whilst I recover and has discussed future exercise plans for when my injury has healed more fully. I look forward to further treatments and working holistically on my health and wellbeing. He was the only person out of a huge number of therapists and doctors who relieved my back pain! He has resolved long standing back issues that no other provider could. He highlighted and treated the cause of long term leg issues for me! I am so grateful! Thanks for keeping my body in good shape Steve. Great work.. He is the best massage Therapist in the World! Steve is amazing. I broke my back and after seeing a lot of other practitioners he was the only one who was able to help me through the worst of it and get it back on track. Yes it took a while but I hate to think where I would be if I had not found Steve. i’m voting for Stephen Lockhart because a few years ago I was told to give away the job I was doing,which happened to be my own small business. not big enough to employ anybody,only me.with bulging discs L4 & L5 it was hard doing normal every day things let alone work. I often finished up in hospital sometimes off work for up to a month.with no money coming in it made things very hard,and nearly loosing my business a few times.often working with a lot of pain and on heavy pain killers and not being able to sleep made life nearly impossible, and then I was given Stephen’s number about a year ago. at first I was going weekly then every 3 weeks and now every 4 weeks, it has really been a life changer,not only for me but my family as well, I can even pick my grand kids up which they couldn’t understand why pop couldn’t pick them up.work is much better,business is pretty good, i’m more positive and I haven’t had a day off with a bad back nor have I seen the inside of a hospital since I started with Stephen.life is fun again. Stephen Lockhart analysed my condition and relieved all symptoms. None have recurred since, several months ago. I cannot speak highly enough of him and his work. I have been to physio and Chiro and Stephen was the one who fixed my problem. He gave me a better understanding of why I got headaches and how they were related to my sore back, pelvis and legs. I found him to be very knowledgeable about his modality. Steve always pin points the problem and gives great relief. You know you’re in good hands! A favourite. Stephen is able to quickly diagnose your problem, and then work competently on your body to start the healing process. He teaches you how to be your own therapist with specific exercises and education. When you see him you know that the experience and the result will be a positive one. All of the above reviews were posted by Steve’s patients after being invited to give their opinion on the treatment he provided and can be found on the whitecoat.com.au website.